MANILA, Philippines — Ayel Estrañero knew what was going to happen, the moment that the University of the Philippines (UP) Fighting Maroons made it to the finals of the UAAP Season 81 men's basketball tournament. Of course, she and the rest of the UP Lady Maroons were proud of the men's team achievement. It had been decades since the basketball team reached the finals, after all, and a comprehensive loss to Ateneo de Manila University could not take away their achievement. 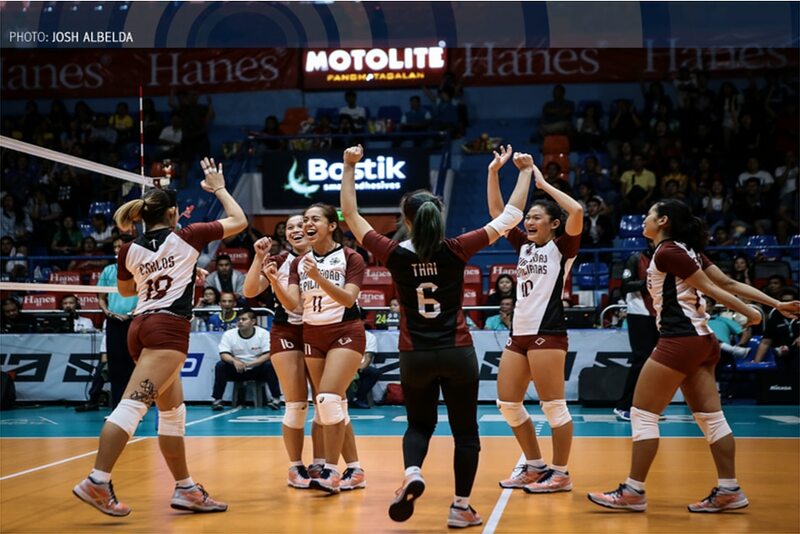 But Estrañero also knew that the Fighting Maroons' historic feat would cast an even bigger spotlight on the Lady Maroons' own campaign in the UAAP Season 81 women's volleyball tournament — a spotlight that was already growing brighter and brighter thanks to their own successful offseason. "Noong naka-finals sila, sabi namin, 'Ay patay, mage-expect rin 'yung mga tao in volleyball season naman'," Estrañero said. "So, of course, it affects how people want us to perform. Like, people also dream big for us," she added. Another UP veteran, Tots Carlos, said they are well aware of these dreams that the UP community have for them. "Yun nga, 'yung mga success and achievements ng UP, motivation sa amin. Pero at the same time, pressure talaga," she acknowledged. "Lagi lang namin nire-remind yung mga tao, sabi kasi nila, basketball tapos na, o volleyball naman," Carlos revealed. Estrañero assured that these expectations — the big dreams of the UP community — are not a bad thing, even as they increase the pressure that the Lady Maroons are already feeling. "Of course, they're dreaming for us to be in the finals, and to win the championship, especially that we won two championships during the offseason," the UP veteran said. "So higher expectations from other people, higher expectations from the team, but I guess we just have to trust the process and take it game by game," Estrañero added. Besides, the Lady Maroons know how to deal with it, said Carlos. "Minsan, napag-uusapan namin, minsan nagti-team talk kami. Sinasabi namin na, huwag naming isipin 'yun. Isipin namin 'yung ilalaro namin this season. Huwag naming i-cut short into the result of the season. So one game at a time," she said. Much like their counterparts in the men's basketball team, the Lady Maroons also missed the Final 4 in Season 80. They battled to a 6-8 win-loss record, winning their last 3 games of the tournament in a display of their potential. And much like the Fighting Maroons, the UP women's volleyball team will also deal with some high expectations heading into Season 81. There's a reason for the heightened expectations: the Lady Maroons won two important preseason tournaments, in impressive fashion. They outlasted Far Eastern University in a five-set thriller to rule the PVL Collegiate Conference, then dismissed University of Santo Tomas in the PSL Collegiate Grand Slam. In both instances, they weren't even playing with a full team: Carlos sat out the PVL tilt, and Isa Molde didn't play in the PSL. Yet, the Lady Maroons found ways to win. All signs point towards UP being a surefire Final 4 contender in Season 81. They have a veteran core with a pair of powerful spikers who can carry the offense in Carlos and Molde, a guiding presence in Estrañero, and highly capable role players such as Marian Buitre, Justine Dorog, and Marist Layug. Their coach, Godfrey Okumu, is entering his second season in charge of the team, and appears to be more comfortable with the Philippine volleyball scene. Combined with a strong crop of rookies, and there's no wonder that the UP community is dreaming big for the Lady Maroons. "Two championships, hindi naman binigay 'yun na free lang," Carlos says, when asked about how they deal with the pressure. "Siyempre pinagtrabahuhan din namin 'yun. 'Yun nga, sabi nila coach, 'yung championships namin, motivation pero at the same time, pressure 'yun," she explained. "So kailangan namin panindigan 'yung championships na 'yun, and mag-perform ng maayos this UAAP." Estrañero, for her part, believes the Lady Maroons should welcome the pressure, the predictions that UP will make it to the Final 4, the whispers that they can even make it all the way to the championship round. "It's good that ngayon, there's that kind of talk, that people actually start to believe that we're actually capable of winning a championship or getting to the finals," she said. "But moreso, it has to come from us," she stressed. "Kami rin, we have to believe that we're capable. Siyempre, kaunting pressure kasi sinasabi nila 'yun, but then it's also an inspiration to actually do better."